Should You Try To Take Care Of Feral Cats? If you notice a feral cat in your yard and would like to open your home to him, there are several things that you should know.First, contact your local and state animal control officials to learn what local laws/ordinances may apply. For example, in some states if you feed a feral cat, you own it. 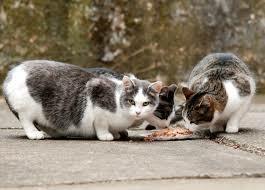 In addition, many municipalities have outright banned the feeding of stray cats, punishable by fines or more. You should also know that a feral cat may never have the same personality as a house cat. They will however slowly begin to show signs that they are comfortable around you and appreciate the care that you are giving them. It is also important to note that caring for feral cats is quite controversial, even in areas which allow such care. Some people feel that all strays should be euthanized, to curb overpopulation, spread of disease, and impacts to native wildlife such as mice and birds. Other feel that these cats should be left alone. Still others feel that these cats have to right to life and should be protected and cared for. Many veterinary clinics offer reduced fees for people assisting feral colonies. In addition, many local humane organizations and shelters sponsor low cost spay/neuter clinics several times a year. Know the facts before you attempt to care for feral cats. Great music on six great radio stations. Check out the stations on THE EDGEWATER INTERNET RADIO NETWORK! This entry was posted on Monday, December 29th, 2014 at 11:48 am	and is filed under Pet Supplies. You can follow any responses to this entry through the RSS 2.0 feed. Both comments and pings are currently closed.